Yesterday afternoon, I went with a group of classmates/housemates to see Gone with the Wind at the Prince Charles Theatre in Soho. I’ve seen it 5 times on the big screen in a variety of theatres with a variety of audiences. Whether it’s at the historic Bay Theatre in Seal Beach, The magnificent Egyptian in Hollywood, or the small town Strand in Marietta, Georgia, Gone with the Wind always makes for good viewing. But I think yesterday was my favorite experience yet. The Prince Charles is one of London’s equivalents to an indie theatre. They often do themed sing-alongs to The Sound of Music, Grease and other films, and regularly screen a repertoire of older movies. It’s also a lot cheaper than the major chain theatres like the Odeon in Leicester Square. The popcorn is good (and cheap) and the seats are really comfortable. All of these factors were brownie points for the Prince Charles, but what made the screening so fun was the people I saw it with. Showing my favorite films to a group of other film students can be a bit nervewracking, especially because Gone with the Wind is a film that I’ve loved so much for such a long time, I really want other people to share in the enthusiasm. Most people had already seen it, although not on the big screen, and one person was viewing it for the first time (this person was more or less tricked because she wasn’t aware that the film ran close to four hours. Sorry, Helen!). After it was over I cautiously gauged their reactions, and they all enjoyed it. Huzzah! The screening in itself was only part of a larger event. Afterward we headed to the Chandos near Trafalgar Square for some drinks and quality film discussion. 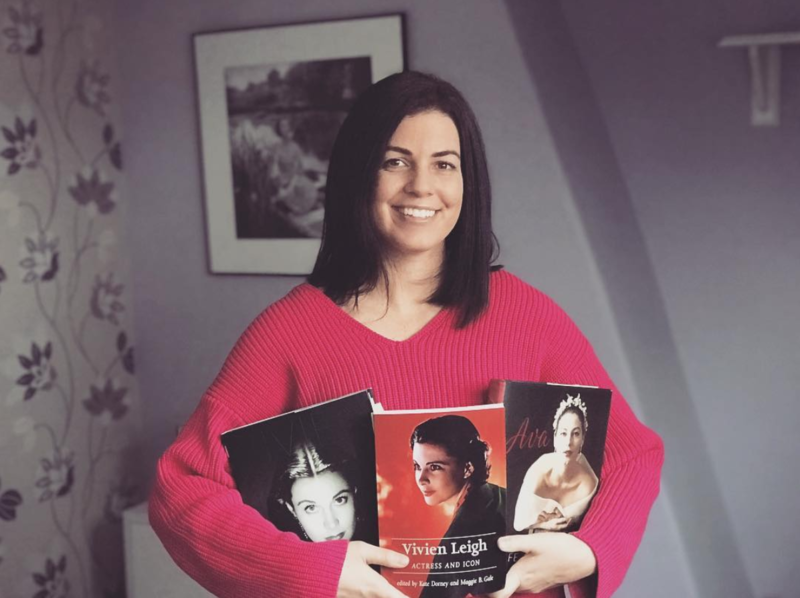 Topics included Vivien Leigh’s beauty and a short-lived debate about whether she had a mustache in the film (it’s just unfortunate upper lip shadow in some scenes, guys! 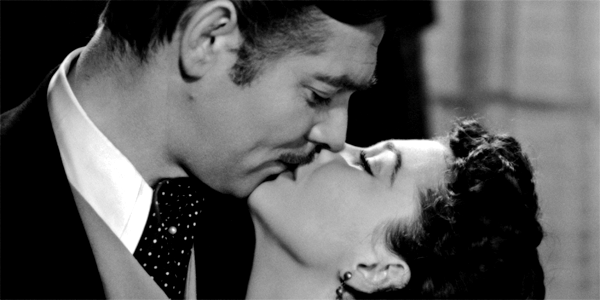 ), how she’s Britain’s national treasure and how Clark Gable was perfect as Rhett Butler. The troupe then moved back to Chinatown for a hearty and delicious meal, good wine and ice cream before calling it a night. As for my personal experience, I can only say that I loved the film just as much this time as I have every other time I’ve seen it. I even cried at the end, and that’s never happened before. Something about Scarlett’s final monologue was extra poignant this time around. Gone with the Wind continues to impress each time I see it, and I’ve seen it many, many times. It will always hold a special place in my heart. This is my reaction every time the end credits roll on GWTW. Gone with the Wind: Good film, or the best film? Beautiful post, Kendra. Sounds like an amazing screening, I wish I was there too and we could have both cried. I always cry when at the end, when Rhett cries, when Melanie dies and when no one hears Scarlett call for Rhett when she’s delerious. Ugh. Kills me every time. Strangely, when Bonnie dies, I’m like, ‘meh, annoying kid.’ Heart of stone for Bonnie. Thanks, Laura! I felt the Orson gif added an extra touch at the end there, lol. I cried once when Melanie died, but I’ve never cried when Bonnie dies, either. Heart of stone. It was really fun! i would have gone alone regardless, but I’m so glad an awesome group of people came along! I can fully imagine how awesome City Lights would be with a live orchestra. I would have cried. Hard. Because that movie tears at my heart. I see, Charlie Chaplin! I CAN SEE! I agree, classic films are always extra special on the big screen! Aww, bless you, Helen! Good times, indeed. Thanks for being a good sport! Absolutely the best film!! I have loved GWTW since I was like 11 and watched it for the first time with my daddy. My husband is good and understands my love of it and tolerates my 3×6 foot picture of Scarlett and Rhett in their first on screen kiss hanging over our bed! I have had people ask how I can like a film where the subject is slavery. This just gets me started on the total aspect of GWTW, as it is so much more than that! I have never gotten to see the film on big screen but truly hope to one day!! And I’m like you Kendra, I never cried when Bonnie dies but I always do when Melanie dies and at the end!! I hope you’re able to see it on the big screen some day, as well! Luckily no one has ever tried to tell me that the real subject of GWTW is slavery. If they did, I’d probably make a face at them and tell them they know nothing about cinema…or something! I just watched “Gone with the Wind” for the first time today, and OMG!!! I loved it. Really, truly loved it. Deeply in love with the film. I would love to go to a screening one day. Also about the Bonnie thing, I thought I was the only one! I kept thinking about how horrible I was because I felt nothing, but I did cry when Rhett and Melanie were grieving and when Melanie died. Weird. When Bonnie fell off the horse, before I knew how seriously she got hurt and subsequently died, I giggled a bit thinking “Stupid kid.” Now I think I’m probably going to hell for laughing at that. Oh, well. How fab that it was your first time seeing it! I remember the first time I properly sat down and watched it. Have you read the book? It’s amazing! Bless Clark Gable for emoting in this film. They really nailed it by casting Clark as Rhett. he’s my favorite character in the story. Hi Kendra … Great blog post! I’m glad you had such a good time, and had another chance to see GWTW on the big screen. Those opportunities don’t come along nearly enough! I think I’ve told you this before, but I had been obsessed with GWTW (book AND film) for almost 10 years before I finally got the opportunity to see it on the big screen, and then I got to see it twice in a theater that same year. My second theater viewing experience of GWTW was my all-time best, and can never be topped, I’m afraid, as that is when I saw it in Atlanta in 1986 for the festivities connected with the 50th anniversary of the publication of the book. It was showing at the FOX Theater on Peachtree Street , right across from the Georgian Terrace Hotel, and I had never seen such a beautiful theater “palace” in my life. The screen was huge and the audience was packed. I have always compared that experience to what I’ve heard goes on at the Rocky Horror Picture Show, as the audience interacted with the screen throughout the entire film. When Yankees or Carpetbaggers appeared onscreen, the audience hissed or booed. When Scarlett shot the Yankee deserter, they stood up and cheered and applauded. When Melanie died people were weeping. And when the film ended the audience stood up again and clapped for what must have been 10 minutes. It was completely over-the-top, and more fun than I’ve ever had in a theater, before or since. I’ll never forget it as long as I live. The next day I got to meet Fred Crane and Marcella Rabwin and spend the afternoon with them, pumping them for all the information I could get out of them about Vivien. They both adored her, and claimed that film didn’t do justice to her beauty (Fred Crane also went on at length about how patient and kind Vivien was with regard to his complete inexperience as an actor). That’s all been over 25 years ago, but the impact of the experience has never left me. The comments here today about Bonnie’s death scene are cracking me up (Bridget and Laura, I mean you! I laughed out loud when I read what you both had to say about it). I have to admit I’m never terribly sorry to see her go, either. All this time I thought it was just me. The part of the film that DOES get me choked up every time is when the words GONE WITH THE WIND go sweeping across the screen at the very beginning of the film. I suppose that has a lot to do with the way the music begins to swell at that particular moment, but I think that is also the point where it really hits me how much this film means to me, and how much Vivien put into making it. I also get a lump in my throat each time I see the scene where Scarlett discovers Twelve Oaks in ruins, as well as the moment when she realizes her mother has died. I think Vivien is extremely moving and powerful in both of these scenes. Somewhat on the flip side of this topic, Kendra … I would love to hear your comments on what you feel are Vivien’s funniest moments in the film. Much has been said in praise of Vivien’s comic timing, and what a shame it is that none of her comedy performances were preserved on film (although I consider much of her performance in SHIP OF FOOLS to be comedic in nature). But I have always felt that her great success as Scarlett was due partly, at least, to the fact that Vivien made the most of every comic opportunity the character afforded her. I seldom see anything written about this and wonder what your thoughts are on the subject. Thanks again for another great blog entry … you’ve kept me thoroughly entertained this weekend! David, I love your comments–they’re so nice and long and insightful! It sounds like the 1986 Atlanta screening was all sorts of amazing. Sad I missed that one. I love a good film audience. Its always fun when people interact with the film en masse. Hmm, think the funniest moments in the film are in the first half. probably when Scarlett becomes a widdow and plots going to Atlanta, also at the bazaar when she can’t be bothered to care about helping the Confederacy by selling things. Also, the proposal scene in the second half. She worked well off of Clark Gable’s flippancy. Which bits do you find the funniest? Hey Kendra … Glad you don’t mind long comments, as expressing myself in few words has never been my gift (nor editing myself down, unfortunately)! When I was in college back in the Stone Age my writing teachers would always make comments to the effect of “could have said twice as much in half the words”. I’m just happy you don’t charge by the inch for your space like a newspaper! But I’m having so much fun participating, and appreciate the friendly response I’ve gotten from everyone. As for Vivien’s funniest moments in GWTW, I completely agree with the ones you chose, and those probably do come to mind first for me (especially Rhett’s proposal scene and her drinking binge in the bedroom before his arrival). I also think she’s hilarious in the scene you quote from at the top of this blog, when she first meets Melanie & Charles Hamilton in the film (as well as meeting Frank Kennedy moments later … the dirty look she shoots Suellen as she chats up ol’ Frank is priceless). She’s also wonderfully funny in the scene where she “offers” herself to Rhett in the Yankee jail for the tax money, as well as the “sewing circle” scene where Scarlett, Melanie, & India are waiting for the Shantytown Raid to be over (her exchange with India, and her utter cluelessness at the whole situation, are brilliantly played). But the point where she always cracks me up most is the “morning after” scene which follows Rhett having carried Scarlett up the stairs. I realize these bits were all written with the intention of being funny, but I still think Vivien deserves a lot of credit for making them as funny as they are. She’s so skillful that it just seems completely natural and effortless. Had someone like Bette Davis played the part I don’t think we’d have gotten nearly as many laughs. I totally don’t mind, unless it has absolutely nothing to do with the subject at hand, lol. But yours are lovely! I agree about the other scenes you mentioned. I guess I’ve just never really thought about it. I wish she’d done more comedy. Have you seen her in The Skin of Our Teeth? She had some great lines in that one. Yes, I did see Vivien in “The Skin of Our Teeth” … thanks totally to you making it available on your website! When I saw that you had added that I about fell over backward with my feet up in the air, I was so happy. I mean, that is just something I never dreamed I would have the chance to see. And she was completely enchanting. While we’re discussing Vivien’s best comedy moments, I have to mention my own personal favorite, and that would be her introduction scene with Lee Marvin in SHIP OF FOOLS. Occasionally I will fast forward through that film just to watch Vivien’s scenes, and she never fails to make me laugh out loud in her first scene with Lee Marvin in the ship’s dining room (“PLEEEEZE doan’t botha’ gettin’ UP!). The expressions on her face and her reactions to him throughout that scene are just hysterical (have I mentioned how talented she was, haha!). I haven’t seen GWTW on a big screen since the late 90s (which was the first time I ever saw it!). Seeing it in all its glory really is worth it. Sounds like great fun. That Kane clapping gif is still the greatest gif ever created. Beats out anything with cats hands down. Wow, I bet seeing it on the big screen as a first viewing is the ultimate way to go! Also, I agree. This gif trumps everything. I’ve seen “GWTW” on the big screen twice and everytime it was quite an experience! I think it’s like Disney movies, a timeless hit..Seeing it today, anyway, I am impressed with Vivien’s and Olivia de Havilland’s acting , so effective and modern, whereas the male cast seem a bit dated; pehaps Cukor’s influence would have done much good to them, too. Clark Gable stands aside, he was Rhett Butler just as Vivien was Scarlett,.I agree with you all said about Vivien’sr gift for comedy, in her scenes with Mummy before the party and with Rhett you even catch a glimpse of how vivacious and pert she must have been in real life. 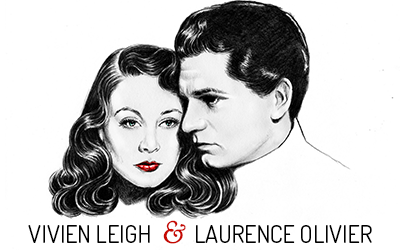 I first watch Gone with the Wind about a month ago it was the first time I had seen Gable and Leigh in a film. I became instant fans of the both of them. I bought the film on blu-ray the other day and reading this blog has got me in the mood to re watch it right away . Thanks. Thanks for commenting, Dave! Welcome to the club!